Disclosure: This is a partnered post with fresh&easy. All opinions are my own. A rich, decadent gelato gets my taste buds doing the happy dance. The Italian sweet has been a favorite of mine since discovering it several years ago. I don't have to eat scoop upon scoop to savor the creamy flavors but can rather indulge in a scoop - a generous scoop, of course. I also love the classic ice cream sandwich. 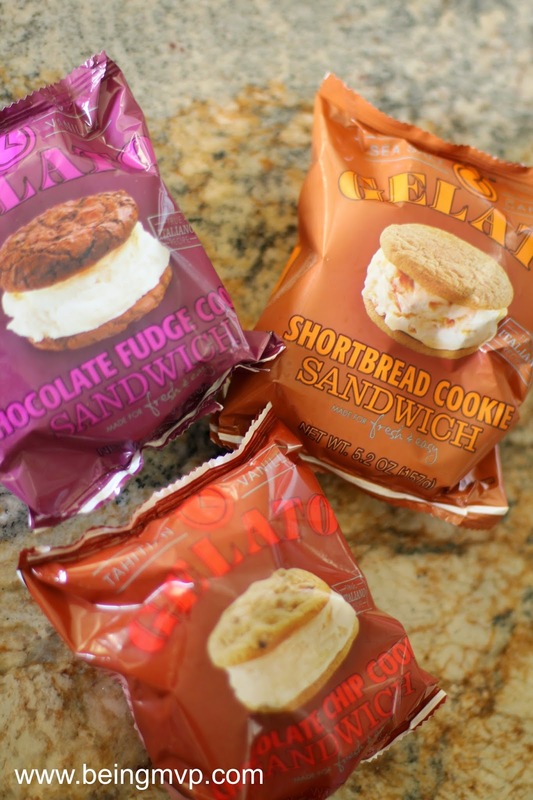 Imagine my delight when I discovered the perfect marriage in Gelato Cookie Sandwiches from fresh & easy! I love shopping at fresh & easy because of how clean and organized the market is. Yes I notice those things! Everything is easy to find and grab, especially when you don't have that much time like me. I'm really an on-the-go shopper and I love all the ready to eat options on weeknights. What's cool is that the market near my house is open until midnight - late night snack run! Shortbread Cookie Gelato Sandwich: shortbread cookies made with a pinch of cinnamon spice combined with a Sea Salt Caramel Gelato. This is Kenzie's favorite. She has been really into caramel lately - food, color, candy, etc. I took Kenzie to fresh & easy after I picked her from school and she saw the sprinkles in the baking aisle. She selected a few and I thought it would be fun for her to "sprinkle up" her frozen treat. 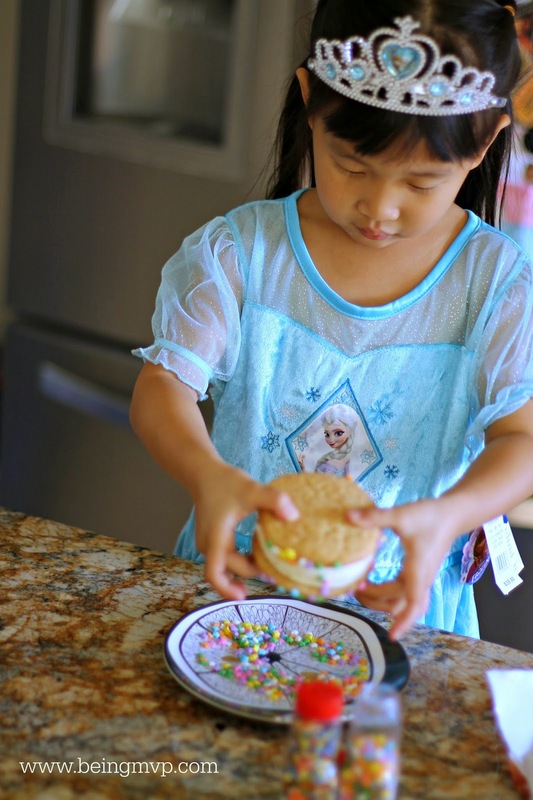 Just pour some fun sprinkles onto a plate and have your child roll the fresh & easy Gelato Cookie Sandwiches and voila - party perfect treat in no time! Chocolate Chip Gelato Sandwich: A twist on the classic with exquisite chocolate chip cookies that are soft in the middle and crisp on the outside with Tahitian Vanilla Gelato. Hubs is a cookie fanatic. For someone who is in the gym at 4am almost every morning, he eats cookies like they are going out of style. When I gave him this after dinner, he thought they were amazing. 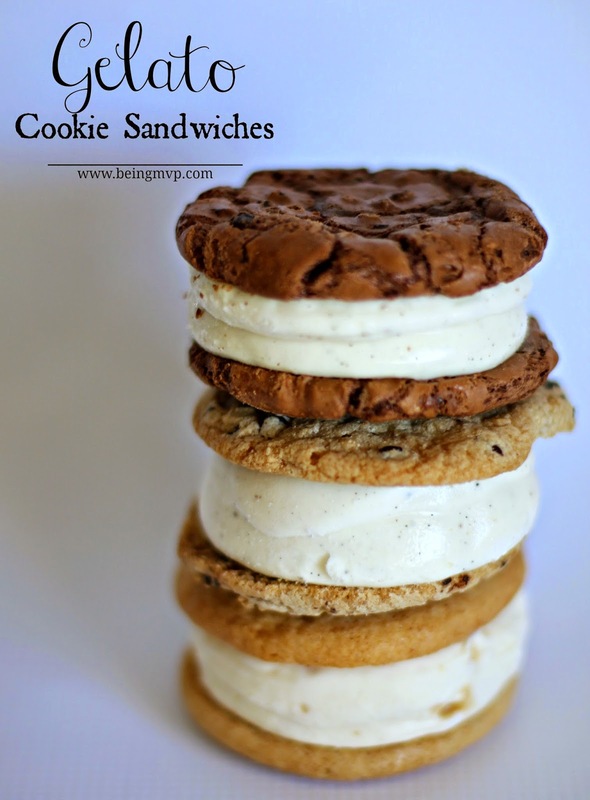 We have eaten our share of ice cream and gelato and this fresh & easy Gelato Cookie Sandwich has really excelled in the category. Chocolate Fudge Gelato Sandwich: Extremely rich cookies made with two different types of European chocolates with Tahitian Vanilla Gelato. Can you guess who gobbled this up? The cookies were almost like the perfect brownies and combined with the creamy gelato, I was in heaven. Mason took his turn going around to everyone to get a bite. Let's just say I'll have to pick up one just for him next time. Since I am sure Kenzie is going to have at least one Frozen themed birthday party this year (she has multiple parties because I feel I have to make it special since she's a Christmas baby), these Gelato Cookie Sandwiches would make the perfect treat for her friends. We can totally have a DIY decorating station and place these on ice for each guest to pick their favorite! Do you enjoy gelato? How about decadent cookies? Head to fresh & easy and pick up some today! These look delicious! I haven't seen them in my area (Indiana). These cookie sandwiches look very delicious! I would love to try one of these. They would be great to serve at a birthday party. Those cookies look delicious, and mixed with ice cream in between, YUM! What a delicious treat! We shop at F&E all the time but I haven't seen these yet. We love their gelato, so I'm sure we will love these when they show up! We started buying gelato last year and it quickly became our favorite frozen dessert. Seeing this in cookie form however...looks so great! These look yummy! We like gelato in our house for a cool frozen dessert. Putting it in cookies is a yummy idea. They all look good but the sea salt caramel sounds the best to me! these look really good. How fun to add sprinkles on them. Wow so simile and it looks great! Wow these sound amazing!! I love the idea of putting sprinkles around the sides!! I hope we have them in my area!! These look sooo good, I would love to pick some up asap!!! Easy and fun!! Your pictures are always so awesome!! I don't know what you use to take them, but would love to find out. I digress...these look so good! It is so hot here that even if I cannot find them in the store I will try to create some out of soft cookies. Holy moly. These look so good! I've never seen them before!